The Spirit of Sharing Xmas hamper is ideal to send corporate clients to share among colleagues, or to take home and enjoy with the family while entertaining over the Christmas holidays. 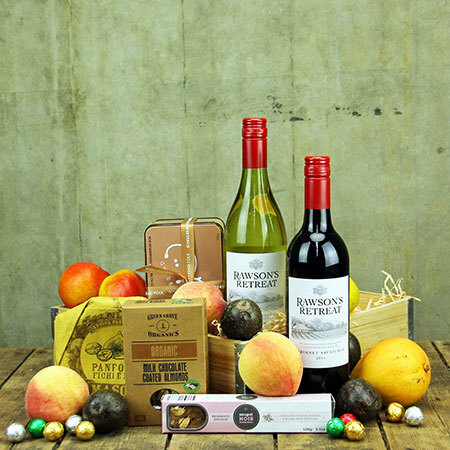 Beautifully presented in a timber crate and adorned with festive ribbon, this Xmas hamper has all the gourmet goods to share and enjoy with a glass of wine. Quality Italian fig & walnut panforte, a selection of fresh seasonal fruit, and cranberry & dark chocolate nougat sound good? Or how about the organic milk chocolate coated almonds and tin of gingerbread folk made locally in the Blue Mountains from all natural ingredients? This is a premium quality Xmas gift guaranteed to please! *PLEASE NOTE: Xmas hampers delivered Sydney metro only. Hampers available from 16th November.